Ottawa Chapter founder, Jim Bauer was recognized for his many years of contribution at the chapter's annual golf tournament. Special ceremony held with members of the Olsen family in attendance. Tony shares his memories of the late founder and industry leader. A reminder to stay true to our founding principles. 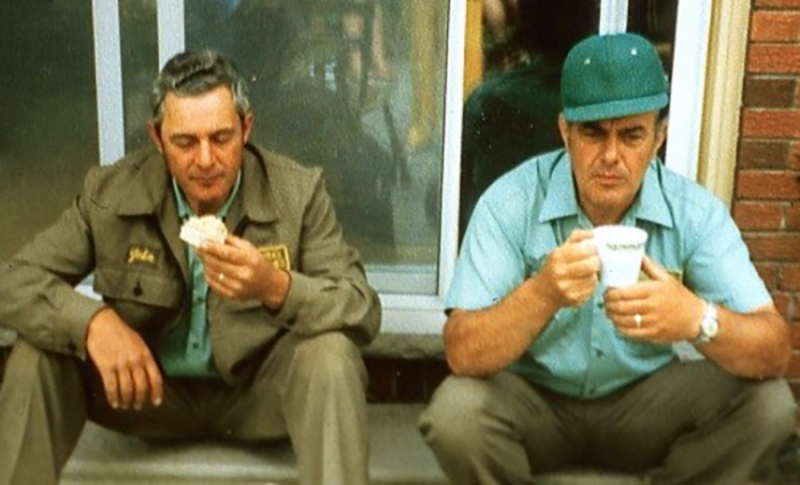 John, left, and David Bakker take a coffee break sometime in early 1970s. John, who passed away in 2012, is wearing the uniform worn by employees at the time. David Bakker has lived his life with the priorities of his life in the following order: God, family, nursery. The first two must be well look after, as the third turned out very well with the success of the family business, J. C. Bakker and Sons Ltd. The family-owned and operated wholesale nursery has been growing quality nursery stock for over 50 years in St. Catharines. David Bakker was born into the industry with his father owning and operating a nursery in Holland before World War ll. Born in 1930, David grew up during the war. He remembers the Dutch flooding part of the nursery to help defend against the German invasion. David was part of the group which formed the Ontario Nurserymen’s Association in 1958. The first president was Arthur Fitzsimmons of Fitzsimmons Garden Centre at Clappison’s Corners. The association’s name was changed in 1964 to Ontario Nursery Trades Association and it joined into Landscape Ontario in 1973. David served on the board from 1958 to 1966. David remembers the early years when the growers began working to improve industry conditions such as tax issues, co-op buying, public education, Sunday closing, unemployment insurance, sale of insecticides and patent laws. The group also pushed the federal government to protect the industry and the Canadian public from imported diseases, and to ensure hardy nursery stock. The resolution read, “It is resolved that all imported nursery stock with soil on the root part of the plant shall be put under quarantine for a period of one year.” David Bakker, Keith Laver, Leno Mori and Ian Smith made official presentation to Canadian Horticultural Council. David also says that the invention of plastic was a big boost to the nursery industry, allowing the development of hoop houses. The less expensive hoop houses also allowed a four to 12-week jump on maturity without heat. Innovation was a big part of David Bakker’s life. In 1960, he drove to Texas where he stopped into a number of nurseries along the way. One nursery was planting sudangrass, which it then turned back into the soil. When the grass is turned over it creates a high amount of humus containing excellent levels of nitrogen. “It creates beautiful soil,” says David. An innovation at the nursery was an industry first when plant identification tags were introduced. “We were the first to have tags on each plant,” says David. “We hired graphics people to create our own tags, and we were also the first to have them in colour.” It wasn’t long before many more growers and garden centres featured the tags. “It was a great way to communicate with the public,” says David. Once the nursery grew, sales staff were hired and the nursery and business expanded. Today, the nursery employs 45 full-time staff, with an additional 80 or more seasonal workers at the peak of the summer season. It has introduced many new plant varieties and is one of Canada’s leading producers of roses. David met with Landscape Ontario in 2017 for this article at his home he has lived in for 61 years. Although he has slowed down, it’s obvious he still lives his life with his three priorities. Lucky for today’s growers that one of those priorities includes their industry. Our mission is to be the leader in representing, promoting and fostering a favourable climate for the advancement of the horticulture industry in Ontario.